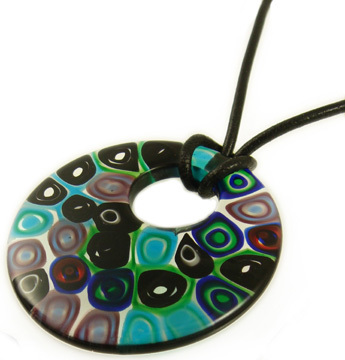 Bold abstract design of aqua, purples, black and green millefiori slices necklace with a off-center top hole. Mounted on an 18inch Greek Leather Cord with a sterling silver lobster clasp. Stylish and modern handmade in Murano, Italy using the famous Moretti glass canes and fused together. This is the perfect Murano Glass Jewelry gift.